On a recent trip to Virginia, I stopped in a used book store and inquired about Masonic or fraternal items. The bookseller produced a couple things then said he was sure he had something about digging up the treasure in the Bruton Parish Churchyard, and that he thought Freemasons were involved. When I professed ignorance about the event he went on to tell a fantastic story about a secret vault in Williamsburg, VA that allegedly contains the original Shakespeare plays, additional writings by Francis Bacon (1561-1626) and other valuables. To fully appreciate the story it’s helpful to 1. believe Sir Francis Bacon actually wrote the plays attributed to William Shakespeare (1564-1616); 2. believe that Bacon was the illegitimate son of Queen Elizabeth I (1533-1603), the Virgin Queen (and for whom Virginia was named), and Robert Dudley, Earl of Leicester (1532-1588); 3. believe that Bacon traveled to America; and 4. that Bacon is the true founder of America, the founder of Freemasonry and essentially wrote the Declaration of Independence and the Constitution of the United States. Whew! Coil's Masonic Encyclopedia doesn't include an entry for Bruton but under Sir Francis Bacon does mention that some maintain his writings, particularly The New Atlantis, "is relied on to assert his connection with Freemasonry." Nothing more definitive in 10,000 Famous Freemasons where it's noted that Bacon was 'thought by some to be a Rosecrucian" and that The New Atlantis "was an early influence on the development of the craft." Searching through several indexes did provide some mention of the Bruton Vault, Bacon and the Vault, and/or Bacon and Shakespeare in various journal articles; a few titles in our catalog did as well. One new book I thought might include some information is Conspiracy Theories & Secret Societies for Dummies, but no luck. Another new book, Master of the Mysteries: The Life of Manly Palmer Hall didn't disappoint. Manly Hall (1901-1990) figures into the Bruton story in at least two significant ways: several maintain that Hall's Secret Teachings of All Ages (which includes a chapter on the Shakespeare-Bacon controversy along with Bacon's portrait neatly superimposed over Shakespeare) provides a basis for the hidden symbols and mystery that buttress the story and, perhaps more importantly, Hall's second wife was Maria Bauer, (1904-2005). While the new biography about Manly Hall is a full look at the life of this interesting, complex man, it does provide some interesting background details about the Bruton story as well. Maria Bauer first heard Hall speak while living in New York but convinced her first husband to move to California to be closer to Hall and his Philosophical Research Society. Interested in the occult and convinced she was clairvoyant, one day while volunteering at Hall's library, Bauer struck up a conversation with someone waiting to see Hall. The visitor said he was a Shakespeare scholar who had deciphered codes hidden in the plays that told of a treasure hidden by Bacon under a church in Virginia. Bauer had once received a woven cloth with images from Williamsburg, including the Bruton Parish Church, so she felt an immediate affinity and decided instead of just talking about it, they should go there and start digging! Somehow, in 1938, Bauer convinced Rockefeller Foundation and Bruton Parish Church officials to begin excavating the churchyard. 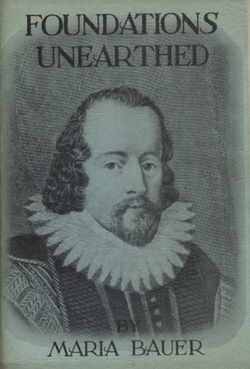 The image above shows the cover of Bauer's first book about the experience with a portrait of Francis Bacon (not unlike the image in Hall's work mentioned above). She published several other works about it, went on to marry Manly Hall in 1950, and continued her quest to uncover the vault until she died. The initial dig in 1938 was followed by several other (both sanctioned and non-sanctioned) attempts. While in 1938 they did uncover the foundation for the original 1676 Bruton Church, to date no vault and no treasure has been located. So, is there anything to the Bruton Vault story? I have no idea. I'd be curious to hear from anyone who does know of any other compelling details, particularly involving a Masonic connection. For those who find the whole story outlandish, perhaps a little more context is in order. The Shakespeare authorship question has existed for hundreds of years and during the late 19th-early 20th century, Francis Bacon was a popular choice as the 'real' author. Similarly, many significant archaeological discoveries were made around that time (e.g. King Tut's tomb in 1922) so it's not too hard to imagine church officials might be persuaded to allow the dig. However, a 1993 article by Frederick Kozub in Skeptical Inquirer, a journal devoted to revealing the science behind pseudoscientific claims, ("Follow-up on the Bruton Parish Church's vault excavation", v. 17, no. 3, Spring 1993) essentially ends the discussion by stating the 9-person archaeological team allowed to dig in 1991 found no evidence of a vault anywhere under the churchyard. What I did find is that the historical renovations one can see above ground in Colonial Williamsburg, and the artifacts recently uncovered beneath nearby Jamestown and now beautifully displayed in the new museum there are well worth time, interest and attention! Bacon, Francis. The New Atlantis. 1627. Online edition available here. Hall, Manly Palmer. An Encyclopedic Outline of Masonic, Hermetic, Qabbalistic, and Rosicrucian Symbolical Philosophy: Being an interpretation of the Secret Teachings Concealed within the Rituals, Allegories, and Mysteries of all Ages. Los Angeles: Philosophical Research Society, 1975. Call number: 11 .H173 1975 A reprint of the 1928 edition. My ancestor Thomas Ballard laid the cornerstone at Bruton Parish. I grew up in Williamsburg and knew of the story of the vault and its location as a child. No one from the Church will acknowlege it's existence. Though it was common knowledge in the early 1960's. The church removed the tombstone located just to the left of the steeple entrance. Ten years ago. There is a plaque in the pew area with his name. The location of the vault is marked by a brass brick in the very center under the steeple entrance way. When I was there last the brick was covered by a pedalstal with a sign. There you have it, believe it or not. Hi Chris, I thought the story was 'out there' but you certainly put it into perspective that it didn't even make the cut for Conspiracy Theories & Secret Societies for Dummies. Thanks for sharing your thoughts and more background information. We looked into the Bruton Vault story, and found it mighty thin. Since we were limited on space in the Conspiracy Theories & Secret Societies For Dummies book, we had to stick to some of the better known, or better documented theories. So, sadly, some of the daffier ones got left on the cutting room floor. Fletcher Richman has been carrying on about the Bruton Vault for years, but has very few believers on his side. Apart from the downright goofiness of burying 144 secret vaults around North America in far-flung parts of the the as-yet unexplored continent (Minnesota? Nevada? ), there's also the delusional Bacon claims. Bacon was a remarkable man on his own merits. Claiming he wrote Shakespeare's works, was sprung from Elizabeth I's womb, faked his death and lived to be 123 is really gilding the lilly. As for the Bruton Churchyard, it's true that Hall's wife did indeed discover the old church's 1623 foundation after digging illegally. Subsequent "expeditions" have been mounted (right where the Bacon believers have directed the diggers, by the way), including inserting rods into the ground in search of the supposed vault—none of which produced any evidence whatsoever. Like the resistance to digging up the basement of Rosslyn Chapel, the Bruton church is more than a little squeamish about letting excited treasure hunters armed with backhoes go poking around a 400 year old burial site. No matter how 'world changing" the discovery might be. The other bit of lunacy involved in this tale is that headstones in the Church cemetery contain mysterious symbols that point the way to the buried treasure, if only they could be deciphered. Ah yes, if only. The tale on these is that Bacon designed them, had them carved in England, and then sent them by ship to America where they would be "planted' in the churchyard cemetery as a treasure map.